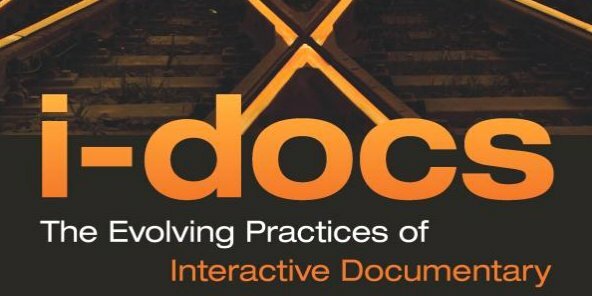 Also check out the recently published i-docs book ‘i-Docs: The Evolving Practices of Interactive Documentary‘ by Judith Aston, Sandra Gaudenzi and Mandy Rose, with contributions from practitioners and academics from the international i-docs community. Aston, J.; Gaudenzi, S.; Rose, M (2017), “i-Docs: The Evolving Practices of Interactive Documentary”. New York: Columbia University Press. “i-Docs special edition” (2012). In: Studies in Documentary Film, vol 6 issue 2, edited by Judith Aston , Jonathan Dovey and Sandra Gaudenzi. Lietaert, M. (2011), “Webdocs… a survival guide for online filmmakers.” Notsocrazy!. With the support of Idfa Doclab. Perlmutter, T (2014) “The interactive documentary: A transformative art form” An expansion of his keynote at Sunnyside of the Doc 2014. Skartveit, H.-L.; Goodnow, K. (2004), “Interactive Documentary”. In: Proceedings of DigiMedia Conference, Cairo, Egypt. Ursu, M. F.; Zsombori, V.; Wyver, J.; Conrad, L.; Kegel, I.; Williams, D. (2009),“Interactive Documentaries: A Golden Age”. In: ACM Computers in Entertainment, Vol. 7, No. 3, Article 41, 27pp. O’Flynn, S. (2011), “Making Public(s): Web 2.0 documentaries and social activism”. In: i-docs Symposium. DCRC – University of the West of England. Green, David, Bowen, Simon, Hook, Jonathan David et al. (1 more author) (2017) Enabling Polyvocality in Interactive Documentaries through ‘Structural Participation’. In: Proceedings of the ACM CHI Conference on Human Factors in Computing Systems 2017. ACM CHI Conference on Human Factors in Computing Systems 2017, 06-11 May 2017, https://chi2017.acm.org/. Association for Computing Machinery (ACM) . Hosseini, M.; Wakkary, Ron (2004), Influences of Concepts and Structure of Documentary Cinema on Documentary Practices in the Internet, School of Interactive Arts and Technology, Simon Fraser University, Canada. Vickers, R. (2012), “Convergence media, participation culture and the digital vernacular: towards the democratization of documentary”. In: Conference Proceedings. International Conference on Communication, Media, Technology and Design (ICCMTD). De la peña, N. et al. (2010), “Immersive Journalism: Immersive Virtual Realiy for the First Person Experience of News”. In: Presence: Teleoperators and Virtual Environments 19, num 4. Pp. 291-301. Domínguez, E. (2012), Periodismo inmersivo: Fundamentos para una forma periodística basada en la interfaz y la acción [Doctoral Thesis]. Barcelona: Facultat de Ciències de la Comunicació Blanquerma. Universitat Ramón Llull. De la peña, N. (2011), “Physical World News in Virtual Spaces; Representation and Embodiment in Immersive Nonfiction”. In: Media Field Journal. Poremba, C. (2011), Real/Unreal: Crafting Actuality in the Documentary Videogame. [Doctoral Thesis]. Montreal: Concordia University. Poremba, C. (2009), “Frames and Simulated Documents: Indexicality in Documentary Videogames”. In: Loading… Simon Fraser University. Raessens, J. (2006), “Reality play: Documentary computer games beyond fact and Fiction”. In: Popular Communication, 4(3), pp. 213‐224. Skartveit, H.-L. (2008), Representing the Real Through Play and Interaction: Changing forms of nonfiction. [Doctoral Thesis]. Bergen: University of Bergen. Squire, K. D.; Mingfong, J.; Matthews, J.; Wagler, M.; Martin, J.; Devane, B.; and Holden, C. (2007), “Wherever you go, there you are: place-based augmenter Reality Games for learning”. In: The design and use of simulation computer games in education. Modeling and simulations for learning and instruction. Volume 2. Whitelaw, M. (2002), “Playing Games with Reality: Only Fish Shall Visit and interactive documentary”.Catalog essay for Halfeti: Only Fish Shall Visit, by Brogan Bunt. Gifreu, A. (2012), The interactive documentary as a new audiovisual genre. Study of the emergence of the new genre, approach to its definition and taxonomy proposal and a model of analysis for the purposes of evaluation, design and production. [Doctoral Thesis]. Barcelona: Universitat Pompeu Fabra. Communication Department. Gifreu, A. (2011), “The Interactive Documentary. Definition Proposal and Basic Features of the Emerging Genre“.In: McLuhan Galaxy Conference Proceedings, pp 354-365. ISBN 978-84-938802-1-7. Hight, C. (2008), “The field of digital documentary: a challenge to documentary theorists”. In: Studies in Documentary Film, Volume 2 Num 1. Bristol: Intelect Ltd, pp 3-7. ISSN 1750–3280. Scott-Stevenson, J. (2011), “The interactive documentary in a cross-platform, community context”. In: Expanding Documentary 2011: Conference Proceedings. Vol. 1, No. 2.